I recently spent a few days at Disneyland Resort taking pictures of signs. I loved the assignment because it wasn’t a far cry from what I like to do in my spare time (I’ve spent countless hours in search of great roadside signage from the past). At Disney Parks, there are plenty of awesome signs that advertise attractions, food and beverage locations, merchandise stops and more. A few months ago, the arts and collectibles team introduced a new art program inspired by these signs. The program has been so popular that I was never able to capture images in locations until this past week. 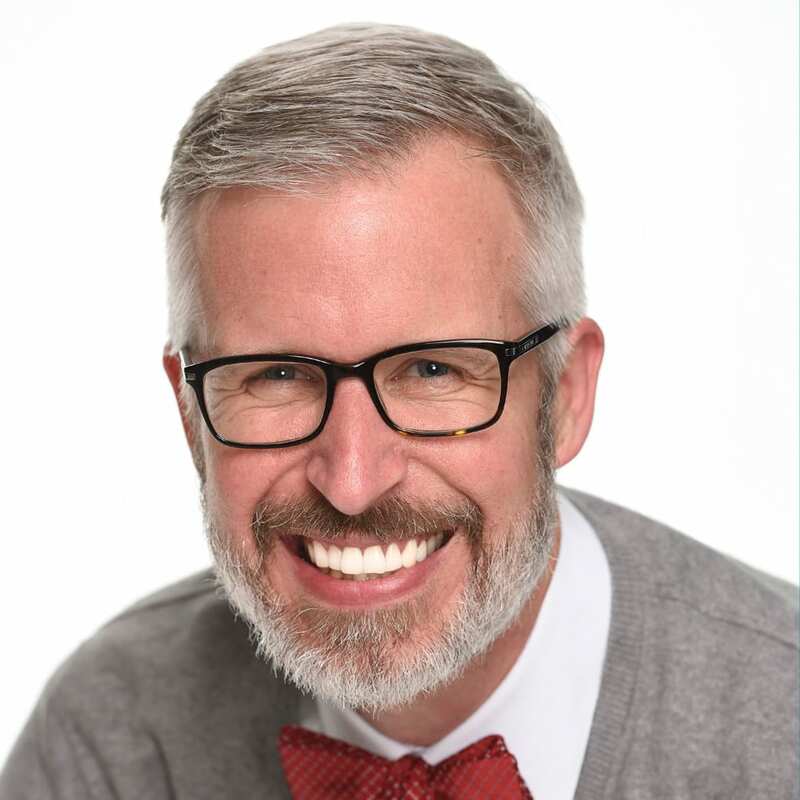 I caught up with senior merchandiser David Whitaker to learn more. 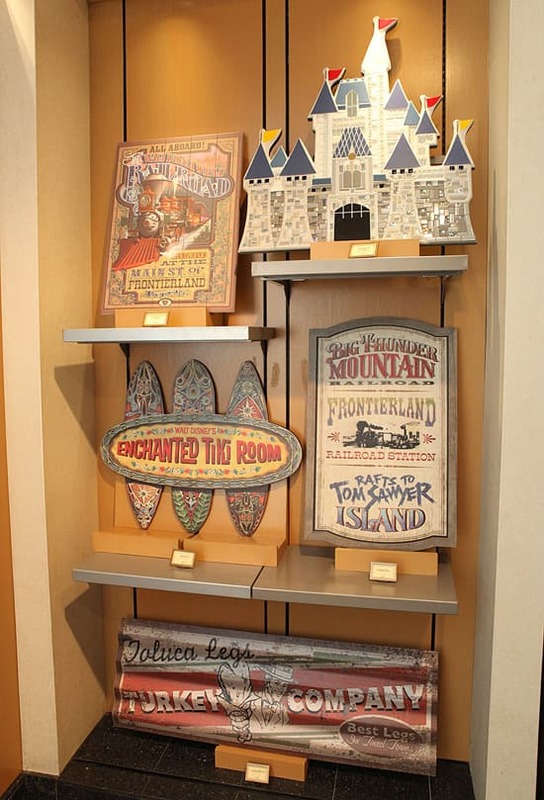 David worked with Walt Disney Imagineering and Disney Design Group to create these oversized replica signs. 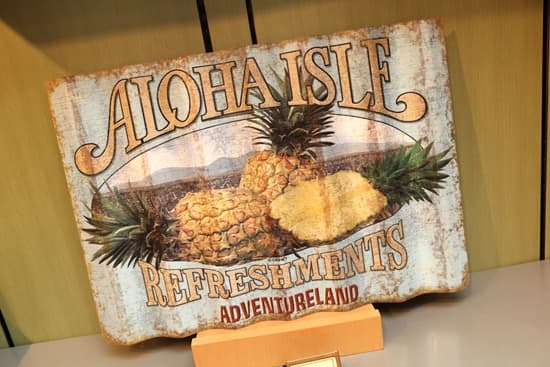 In some cases, they reproduced the sign almost exactly how it looks at Disney Parks (see my favorite – Aloha Isle Refreshments – for a great example). 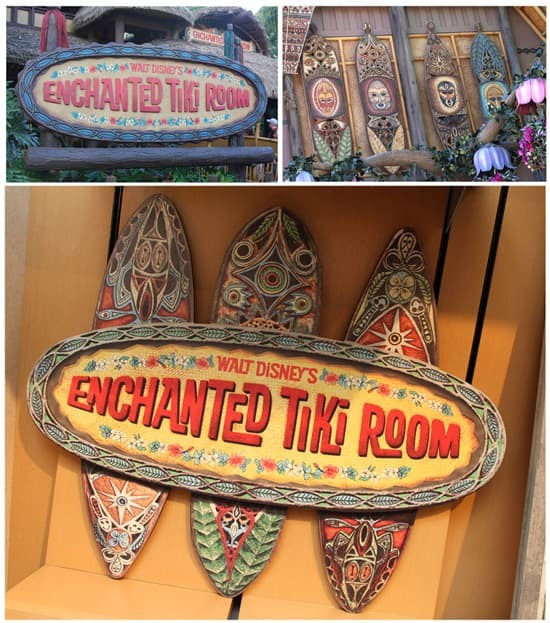 In the case of the sign for Walt Disney’s Enchanted Tiki Room, the art team combined elements to create the final sign. 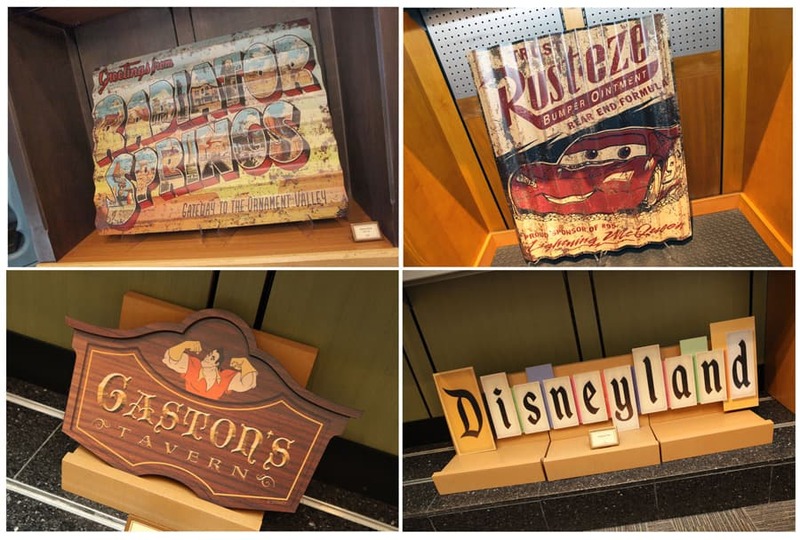 The signs are currently offered at the Art of Disney location in Downtown Disney Marketplace and Animation Gallery at Disney’s Hollywood Studios. There are also two Disney•Pixar’s “Cars“-inspired signs found at select locations in Cars Land at Disney California Adventure park. Finally, you may also find the Gaston’s Tavern sign in New Fantasyland at Magic Kingdom Park. David said they intend to have some of these signs offered at the Disneyland Resort at a future date. There are, however, no immediate plans to carry them via the Disney Parks online store. Now all I need is a replica Dole Whip machine and I’m all set! I’m really having trouble finding some of these signs! I won’t be in the parks until December..is there anywhere I can locate them? I’m looking specifically for Disneyland Railroad, and Big Thunder signs. Are they available at World of Disney in Downtown Disney? Our game room already was themed for The Enchanted Tiki Room so the sign was a great addition! We picked it up yesterday at Downtown Disney, along with Jose and two great Tiki statues. The signs look AWESOME!!! I will be down there next week and would love to pick one up! Are they all LE ? And do you know how many of them they are making? I can see the Castle is 50 LE but do you know any of the other edition sizes on them? Would you be able to find out the dimensions for the Thunder Mountain sign. I didn’t see it mentioned in the earlier postings. Thank you so much. Is there any way to get these if you aren’t at the parks? We aren’t coming until November. Thank-you for making merchandise we have always wanted. ‘Can’t afford them all, but they’re truly outstanding! I wish they would offer a replica of the Splash Mtn sign “You May Get Wet” with Brer Rabbit. I have wanted one for years to display at my pool. Steven- Would you by chance know the dimensions of the Disneyland sign? And are there any plans for a second series of signs in the works? Thank you in advance! @Tyler – The Disneyland sign measures 36″ wide by 10″ tall. At this point, they are focused on this first collection. Yet there could be additional signs in the future. @Raemi The mosaic castle was debuted as part of the “Disney Crowning Achievements” feature in the Disney Gallery last spring. If memory serves they were around $2,500 or $3,000? At Disneyland you could find it on Main Street in the Disney Gallery – which is now Disneyana. @Erin – An Enchanted Tiki Room living room?!?! WOW!! The collectibles team said the sign measures approximately 30” wide and 24” tall. Would love to see a sign for the best ride on Disney property–Tower of Terror!! @Julie – Here you go. Please note each moasaic Castle has an edition size of 50. Bummer!!! I have a Disney Bar at home & some of these would be PERFECT for it! I won’t be @ WDW until next winter unfortunately… Too bad they won’t be offered online. 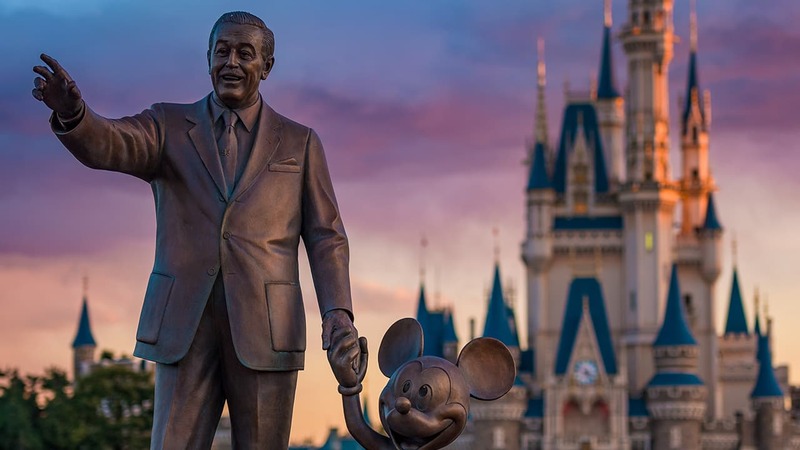 Thank you for sharing this very exciting post, and just before our summer vacation to Walt Disney World. I’m always looking for unique yet inspirational works of art. I believe I’m ready to buy a few and begin my collection. @Jacqueline – You’re welcome! I’m glad you liked the article. I was pretty jazzed to see them in concept form last year. I figured there may be a few other folks like me who loved the idea! I absolutely LOVE the Tiki Room sign! A must-have!!!! Where would the “All Aboard! Walt Disney World Railroad” sign be able to be purchased? Do you have the sku for it? Thanks! @Jackie – The Railroad sign was designed by Jeff Granito. The item number is 400004392598 and retail is $150.00 (plus tax). Oh man. First the pile of Haunted mansion items and now this. Good thing I’m driving to Disney in a few weeks and not flying! Can you give me more info about the castle in the second picture? How much is it and where can I find one? It’s beautiful! @Raemi – The Castle you see in the second photo is a limited edition mosaic piece. There is also a version of Sleeping Beauty Castle that was opposite Cinderella Castle (I didn’t photograph it). Here are the item numbers and retail. Each Castle has an edition size of 50. Ate their any plans to make wdw signs? I want to also tell you Steven I was impressed with the size of the signs (I can at least speak for the Tiki Room one!). It was wonderful to see it was made in the USA as well!!! Do you know if all of them are? Why in the world aren’t they available at Disneyland???? that is very odd and disappointing. @Mike – I’m sorry for your disappointment. I invite you to read my response to Gregory (#7) above. This may give you some additional insight. Also, Disney California Adventure park is part of the Disneyland Resort, so the last two paragraphs conflict. @Gregory – As it turns out, the Disneyland sign is actually one of the most popular (along with Walt Disney’s Enchanted Tiki Room and Aloha Isle Refreshments). The collectibles team has been placing reorders rather frequently since the signs were first introduced. As mentioned, their plan is to eventually carry additional select signs at Disneyland Resort (like the Disneyland marquee). The Cars Land signs are only being sold in California at this point, so I’m unsure what you mean by the paragraphs conflicting. I included those signs in this article as they are a part of the bigger program. I apologize for any confusion. I’ve learned that we periodically like to test new concepts or items in one location first. If successful, the test items are then introduced to additional locations. A great recent example would be the Start Wars – Droid Factory. It was first introduced at Disney’s Hollywood Studios in Florida. After it proved to be extremely popular with Guests (and after space was located in California), it was added to The Star Trader at Disneyland Park. It was also added to Once Upon a Toy at Downtown Disney Marketplace. I hope this insight is helpful. Yeah, as #1 pointed out – where but Disneyland would you sell a Disneyland sign? Oh my. My wallet can’t handle all this!!! I got a Tiki Room sign a while ago, and when you say the program is so popular, you are right, because it was rather hard to get!!! Do you have sku’s for the Big Thunder Mt/Frontierland/Tom Sawyer Island and the Greetings from Radiator Springs?? @Collen, Adam & Johnathan – Most of the signs are $150 (plus tax). The Gaston’s Tavern sign is $65 (plus tax). Please note that all retails are subject to change without notice. As for item numbers, here you go! These are brilliant! It’s like having a little piece of park heaven right inside your home. I hope the pricing isn’t too heavy on these items. Would like to see them available to all customers. Most art pieces at Downtown Disney are out of people’s price range. @Elizabeth – Well now I’m hungry! Road trip to Disney’s Polynesian Resort perhaps for lunch. Ha! I’m confused… is the Disneyland sign not available in Disneyland?